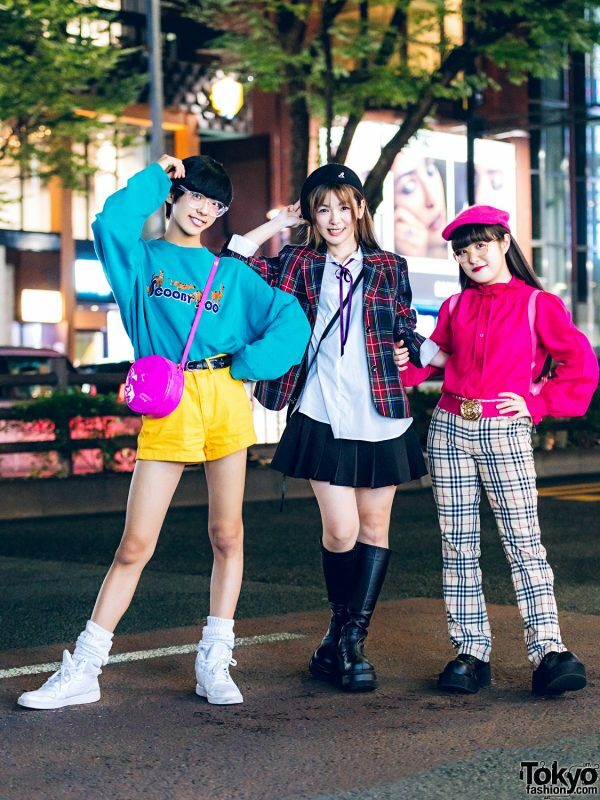 While out on the streets of Harajuku one evening, we came upon this trio. 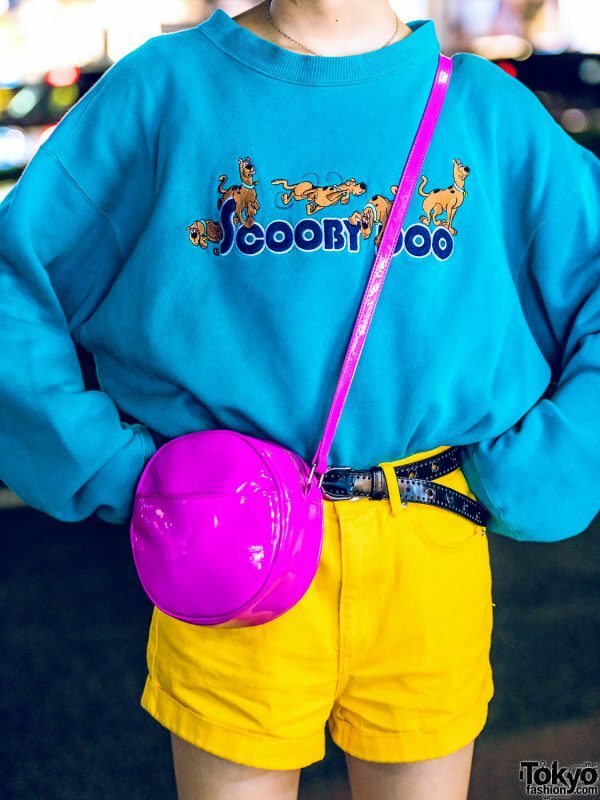 Their colorful streetwear ensembles caught our eye. 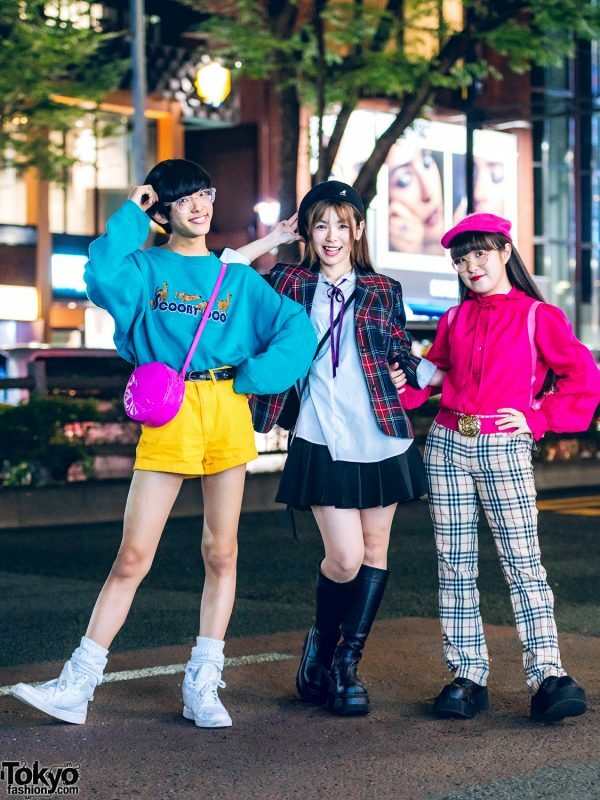 At the left is 16-year-old Soso, whose outfit features a blue Scooby Doo sweater, tucked into short yellow shorts from Forever21. White ribbed socks, white Nike high top sneakers, and a pink patent leather round sling bag from Peco Club completed his look. 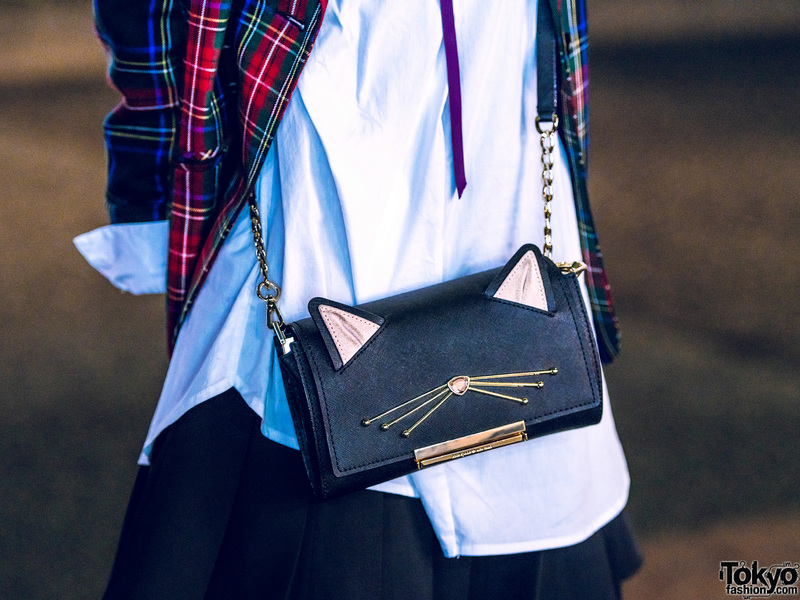 Clear eyeglasses and a black leather belt rounded out Soso’s street style. 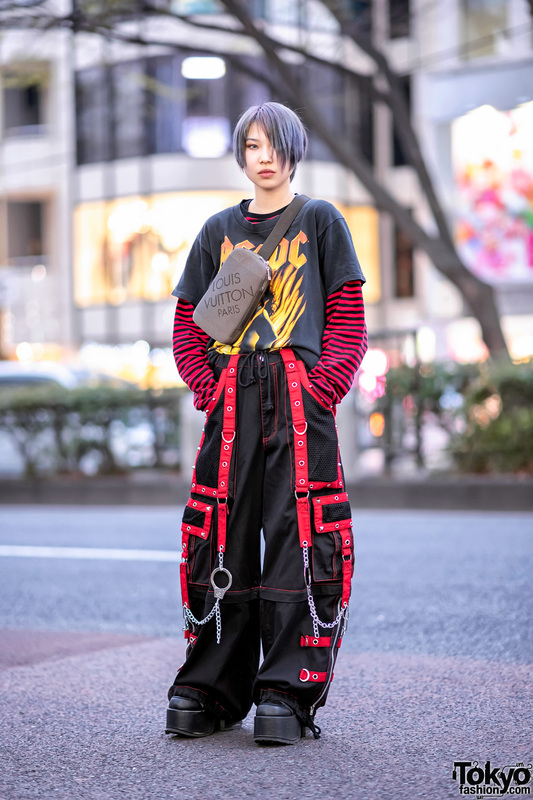 RRR Shop, Peco Club and Pinnap are some of Soso’s favorite fashion labels, and he likes to listen to 80’s music. Follow Soso on Twitter and Instagram. Sporting a black Kangol beret at the middle is Miwa, who works in the apparel industry. She stepped out in a plaid blazer from Funktique Tokyo, worn over a white long sleeved collar shirt, which she styled with a purple ribbon tie. She donned a black resale plaid skirt, knee-high platform boots from Demonia, and carried a black leather cat sling bag from Kate Spade. Catching attention with her pink outfit is Miori, a 17-year-old student and the daughter of Miwa. She is wearing a pink long sleeve ruffle bow blouse from Chicago Harajuku, tucked into resale tan plaid pants. 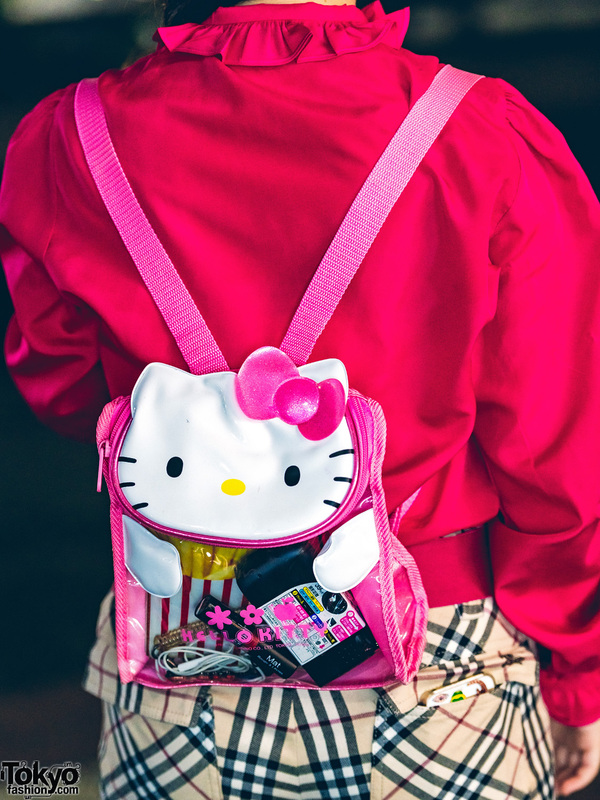 Black platform lace-up shoes from Demonia, a Hello Kitty see-through backpack from Kiki2, and accessories from New York Joe Exchange such as a pink newsboy cap and a wide pink belt with a gold buckle finished off her pink-hued fashion style. 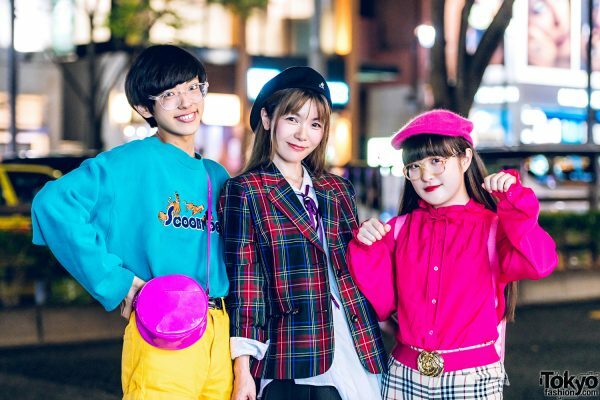 The Four-Eyed is Miori’s favorite brand, and she loves the music of Momoiro Clover Z. Miori is also active on Twitter and Instagram.